A tour through a world too small to see with a microscope: air, ice, diamonds, aspirin, fuel cells, and other structures viewed and described in the scale of nanometers. The world is made up of structures too small to see with the naked eye, too small to see even with an electron microscope. Einstein established the reality of atoms and molecules in the early 1900s. How can we see a world measured in fractions of nanometers? (Most atoms are less than one nanometer, less than one-billionth of a meter, in diameter.) 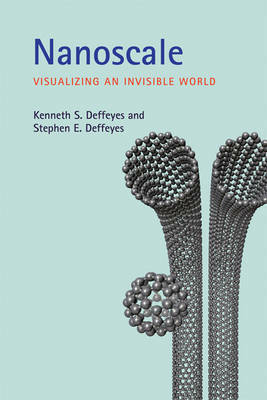 This beautiful and fascinating book gives us a tour of the invisible nanoscale world. It offers many vivid color illustrations of atomic structures, each accompanied by a short, engagingly written essay. The structures advance from the simple (air, ice) to the complex (supercapacitator, rare earth magnet). Each subject was chosen not in search of comprehensiveness but because it illustrates how atomic structure creates a property (such as hardness, color, or toxicity), or because it has a great story, or simply because it is beautiful. Thus we learn how diamonds ride volcanoes to the earth's surface (if they came up more slowly, they'd be graphite, as in pencils); what form of carbon is named after Buckminster Fuller; who won in the x-ray vs. mineralogy professor smackdown; how a fuel cell works; when we use spinodal decomposition in our daily lives (it involves hot water and a package of Jell-O), and much more. The amazing color illustrations by Stephen Deffeyes are based on data from x-ray diffraction (a method used in crystallography). They are not just pretty pictures but visualizations of scientific data derived directly from those data. Together with Kenneth Deffeyes's witty commentary, they offer a vivid demonstration of the diversity and beauty found at the nanometer scale.